Wubba lubba dub dub! Yet another free content update has hit Pocket Mortys (Free) and adds even more incentives for fervent Morty trainers to collect ’em all. First and foremost, 11 brand new Mortys are added into the wild, providing even more bizarre, disgusting and/or incredible variations to catch. Whether you prefer your Morty to be infected, made of goo or having numerous different appendages on his face, there surely will be something for everyone and even more options of Mortys to lead into battle. The most interesting variant, however, appears to be the Morty fanboy Morty, which is Mortyception if there ever was such a thing. 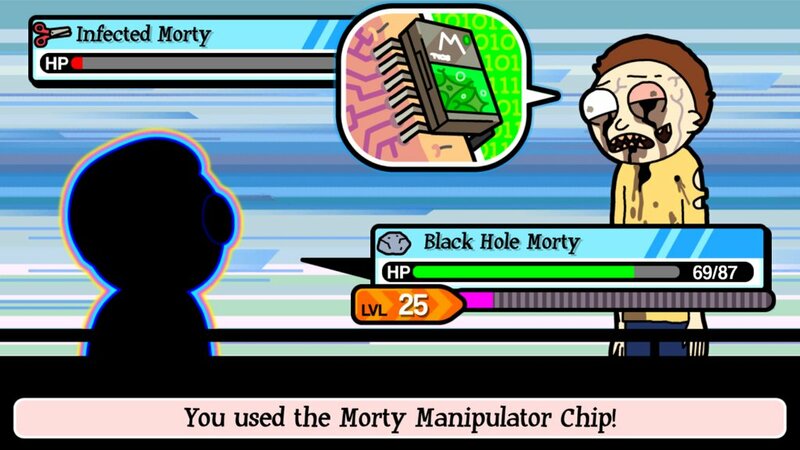 This isn’t the only addition to Pocket Mortys, as new attacks Poison and Absorb are added to the game (both of which feel strangely familiar to another particular turn based RPG), as well as items Poison Cure and Courier Flap, the latter of which takes you back to the central Citadel hub. Finally, the addition of a Move Tutor Morty Labs allows you to re-learn moves you have forgotten previously in the game, so that regardless of the age of your Morty you can still teach it whatever attacks you want, and you can change your Morty’s play style based on the other team members you bring with you. Certainly a welcome update, if only to help plug the gap during the excruciatingly long wait before Season 3 of the show.